Lollipops are cavities on a stick and soda is pure sugar in a can. Candy and soda cause tooth decay. You’ve been taught this since grade school. This is not news, is it? Well, what about the fact that sports drinks ruin your teeth, too? Heard that one before? Dr. Amir Davoody and the team at Greater Houston Orthodontics want to make sure you understand sports drinks can damage healthy teeth. Actually, “erode” is more like the term, especially around the brackets while wearing braces. These sort of drinks erode your teeth by “demineralization,” or reducing the minerals in the outer tooth enamel and also the dentin (“dentin” is a yellowish, calcified tissue underneath the tooth enamel). It doesn’t affect the enamel underneath the braces covered by the brackets. Dental erosion is common. It happens when you lose tooth structure since acids dissolve enamel and dentin. When your teeth are exposed to an acidic substance like a sports drink, soda, or candy, dental erosion is not far behind. Everyone knows about candy and soda. Sports drinks, on the other hand, are not thrown into this group of tooth killers. And energy drinks and some flavored waters can be just as harmful if they contain citrus flavoring. Are sports drinks the only source of dental erosion? Actually, there are many factors that contribute to dental erosion. As we age, our teeth naturally lose some enamel over time. Dental hygiene is also a big factor; if you keep your teeth clean and healthy, the acids and plaque are kept to a minimum and your teeth will last longer! Remineralization, as the word suggests, is the process of building minerals needed for strong teeth. A tooth has biofilm coating for protection. But when your teeth are exposed to acids, your biofilm decreases and your teeth lose their surface minerals. You are messing with your long term dental health when you drink a sports drink like Gatorade. Here is an online link to the ingredients in Gatorade. Water is the number one ingredient with sugar #2 and citric acid #3. This acid invites growth of acidogenic bacteria and leads to erosion of teeth. In addition to that, citric acid forms complexes with calcium and lowers the effectiveness of the biofilm. That is why sports drinks have been reported to cause three times as much damage to enamel compared to soft drinks. Phosphoric acid, which is a component of soft drinks, is not as harmful as citric acid. 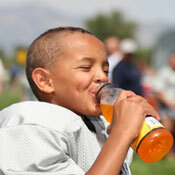 The simplest way to prevent sports drinks from damaging your teeth is to avoid them and drink water. For most physical activity, water is sufficient to keep you hydrated and fresh. Also, most sports drinks now offer a low-calorie alternative that has little or no sugar. While they might taste different and lack the “sugar boost” of their counterparts, sports drinks without citric acid and sugar are better for your teeth. If you do drink soda or sports drinks, no sipping. The number of contacts with the teeth makes the problem worse. DO NOT BRUSH your teeth afterwards; it makes the problem much worse. The enamel is weak from the acid. It takes at least a half hour of saliva contact on the teeth to allow some recovery and repair before the enamel can withstand the harshness of the toothbrush. It is counterintuitive, but brushing after drinking acidic drinks causes the problems to worsen. There is also a definite relationship between dental erosion and the consumption of acidic (sweet) drinks, as well as obesity and diabetes in both children and adults. Remember: it always pays to be mindful of what you take in to your body! Whether a solid food, candy, soda, or sports drink, take the necessary steps to prevent unwanted conditions in any form that can damage your teeth. There are many sports drinks and flavored waters sold today. We recommend you take the time to read the labels. Check for sugar content and citric acid in the ingredients. If they are one of the top ingredients on the label we suggest you avoid them. It can save your teeth and improve your dental health over a lifetime.